Since their introduction over thirty years ago, dental implants have become the most popular choice for dental restoration. Their large variety of shapes and sizes — a far cry from the limited choices of the 1980s — has only served to increase their popularity. In recent years there's also been an expansion in their applicability. Most people recognize them as replacements for individual teeth — but they can do much more. They're now playing a pivotal role in other dental restorations or situations. Here are 3 of those “cutting edge” ways implants could change your dental health and smile for the better. Fixed bridgework. In a traditional bridge, prosthetic (false) teeth use the natural teeth on either side of the empty space for support. In this updated version, implants become the support base for the bridge. For example, a bridge as small as three crowns can be supported by two implants attached to the outside crowns of the bridge. Four to eight implants can support a bridge as large as an entire arch of teeth. Over-dentures. In cases of significant bone loss, a full or partial denture may be a better option than a fixed bridge. Traditional dentures, though, can contribute to even more bone loss, which can cause the dentures to eventually lose their fit. Implants not only can help stop further bone loss but can also stimulate increased bone density. Two or more standard or mini-sized-sized implants can support a full or partial denture. Orthodontics anchorage. 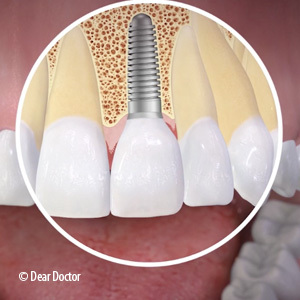 People with missing teeth aren't the only ones who can benefit from implants. While most bite repairs only require the back teeth to provide anchorage for braces, certain complex bites may need a different point of anchorage. Orthodontists can create a more feasible anchorage point with an implant or a temporary anchorage device (TAD) imbedded in the jaw. This can help isolate teeth that need to be moved from those on the arch that don't. Which Cosmetic Treatment is Right for You? What Is Proper Flossing Technique? How to keep your gums healthy? Sensitive Teeth? Opt For In-Office Whitening! Join our Practice by reviewing us online!